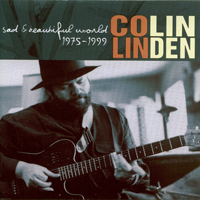 Colin Linden compilation with several guest appearances from Band members, released by Sony Canada in 2000. Guitars & Vocals: C. L.
Electric Guitar & Vocal: C.L. Acoustic Guitar & Vocal: C.L. Electric Dobro & Lead Vocal: C.L. same personnel as "When The Carnival Ends"
Thanks to all my friends at Sony Music Canada, especially Sonia Sorenson, Greg Pappas, David Quilico, Rick Camillieri, Don Oates, Mike Roth, Susan Dineen and Richard Zuckerman. Thanks to all the great musicians who played on these songs over all these years, and particularly my dear friends Gary Craig, Richard Bell & Johnny Dymond. Thank you to John Whynot, a friend beyond compare who worked on most of these records in some capacity, and whose work inspires me every time I'm in a recording studio. Thanks to Andrew Mech in Toronto & Babara Behler in Nashville and everyone else at Warner-Chappell Music, who have been my publishers since "When The Spirit Comes" back in 1987. Thanks to The Band -- my favourite group of all time -- for letting me make music with you. Thank You always Bruce Cockburn for all your friendship & inspiration. Thank You my brothers in Blackie & The Rodeo Kings. Thanks to Rob Bowman for caring, and for the attention to detail. Thank You Tom Carrico, who guides the ship as it moves in many directions simultaneously. Thanks to my Mom and my brothers, who are never afraid to veer from the conventional.